Jacolien Wubs works on her PhD project ‘To Proclaim, to Instruct and to Discipline. The Visuality of Texts in Calvinist Churches in the Dutch Republic’ at the University of Groningen, the Netherlands (funded by NWO – The Netherlands Organisation for Scientific Research). The aim of this study is to analyze text panels and text paintings that appeared in many Dutch Protestant church interiors in the late 16th and early 17th centuries. The panels are studied from two perspectives: firstly as material objects in their spatial setting, namely the church as a place for the liturgical ritual and for the community to gather, and secondly as conveyors of theological and moral contents. A European contextualization will be aimed at situating these panels, so characteristic of the Dutch Calvinist church interior, in the broader framework of developments in other Protestant countries. In its approach to the Reformation this study will draw attention to aspects of continuity alongside changes in the furnishing and use of churches, by viewing Protestant text culture both as a continuation and adaptation of late Medieval visual culture. In doing so, this study aims to modify and correct the traditional and still prevalent view of Calvinist church interior as ‘sober’ and ‘austere’. 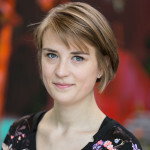 Jacolien Wubs graduated from the Research Master in Art History and Archaeology at the University of Groningen in 2014. In 2011/2012 she contributed to the preparation of the exhibition ‘At Home in the Bible. Old Masters, Great Stories’ (held in 2014) during an internship at Museum Catharijneconvent, Utrecht.